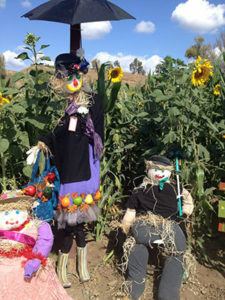 UPDATE 2018 – Unfortunately, Lombardi’s Ranch has closed down and there are no more Scarecrow contests and no special events at the old location.There is an alternative and although they don’t have a scarecrow contest, there is plenty of fun to be found at Gilchrist Ranch located very near the old Lombardi’s location. 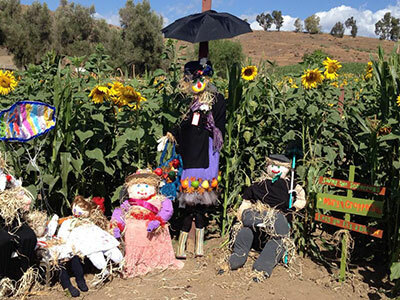 It’s the beginning of Fall here in Valencia at Mary’s Schoolhouse and once again the teachers, children and parents combined their efforts for another entry in the Scarecrow Contest at Lombardi’s Ranch. Creating our yearly scarecrows for the Lombardi Ranch Scarecrow Contest is such fun, and all of us do our part to bring it together. The teachers give each child the individual time to work on the scarecrows, and in the end, all the children contributed to make our scarecrows the best they can be. This is not a project done by the adults, but rather, it’s a project planned and supervised by the teachers, but the kids do the actual work. Each year the children and teachers at Mary’s Schoolhouse create their scarecrows and enter the contest. It’s definitely not about winning, but we use the opportunity to teach the children everything possible, such as letters, numbers, art. The children here at Gregory Family Child Care, aka Mary’s Schoolhouse, are excited to make the scarecrows and we take advantage of their excitement to stimulate their interest in learning. We are constantly coming up with ideas for fun and exciting projects and believe learning should be fun, especially for preschool children. Not only that, but when the parents also participate in our projects, the children become even more excited and it really brings everyone closer together. This year, some of the parents donated supplies for building the scarecrows, others showed up at Lombardi Ranch on a Saturday to install the scarecrows and we want to extend a special thank you for the creative abilities of our sign maker, Holland’s mom, Chelsea Emmons. We’re so grateful to have such a wonderful group of children enrolled in our child care and it’s certainly a reflection on all of their amazing parents. Below see just a small portion of all the images we took of the scarecrows, mostly on the day we set them up at Lombardi Ranch. If you’d like to see more photos from Mary’s Schoolhouse, visit our Gregory Family Child Care Facebook page. Click the image below to see the full size.